Should I switch from Sendgrid to Amazon SES? Update: A new comparison with updated Sendgrid prices, and Postmark is available here. 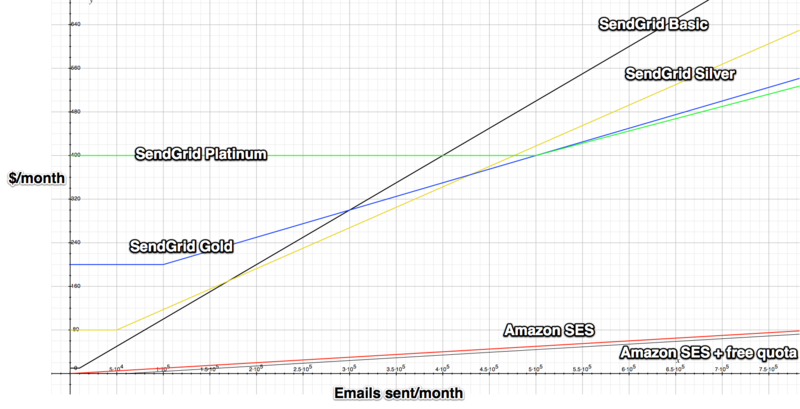 Cost comparison for Amazon SES/Sendgrid, click for a larger version. SendGrid can’t be too happy with that, in short at no point is it better to go with SendGrid over SES if you are only taking price into account. Of course SendGrid have value-add over just plain email sending, you decide if it’s worth the premium, but for me the only feature I’d want would be the ‘Whitelabel’ option, and Amazon SES has that included. Cost comparison for Amazon SES/Sendgrid + EC2 instance cost , click for a larger version. So, there is no point in spinning up an EC2 instance to take advantage of the 2000 free emails per day. I will be interested in SendGrid’s response to this. Possibly lowering prices? For me certainly their value-add isn’t worth the extra cost over Amazon SES. Quick hack — Amazon will let you have a free micro EC2 instance. Sign up for that, and you can use it to send your free email quota. Travis: Check the second graph, it’s not worth it. Yes, Amazon SES is a price that is hard to beat. The real question is, will it be a worthwhile solution in the long run? Due to Amazon’s lax policies, the EC2 IP blocks have been blacklisted due to spam and the like. If they maintain this lax policy, it will only be a matter of time before SES gets blacklisted and becomes largely unreliable if you actually want the e-mail you send to get to the recipient. If your not using the analytic functions etc of SendGrid then why not just setup your own SMTP server – it isnt as hard as Amazon and others would have you believe. Dave: I’ve run exim, sendmail, postfix and qmail installations, all of which required maintenance time. If you have a large mail volume you might need a dedicated server, and it’s not hard to get a configuration wrong and end up getting email dumped by ISPs. Compare that to the minimal cost of sending email through a managed service like SES and it becomes less attractive to run your own. Dave: I was the CTO at a large email/security outsourcer running large volumes. As Will pointed out, and I agree, the costs of these services make the roll your own very unattractive. The question isn’t it’s ease, but is it a good use of time/money. The SES offering shows the economic value stripped of any glamour. As a modern SaaS company, services like these are a no brainer, we’ve got more important higher value fish to fry. Analytics aside, the main issue some web apps might find is that you cannot send emails on behalf of. Many web apps that have a small messaging functionality for the user to invite friends or send reminders might need to send these on behalf the user’s email address to increase open rates. We used sendgrid a few times for a few million contacts, it crashed every time we sent with them. I’m definitely interested in seeing if this ends up being more reliable for large volumes like that. We’re currently launching e-commerce operations and along with it a newsletter system. Sendgrid is a strong contender, but with the new option of Amazon SES popping up we were wondering which solution might be more competitive, especially since we’re planning to use an EC2 instance anyway. Thanks a lot for this very timely and helpful comparison, we’ll take it into account! If you are looking for a minimalist service for the best price, then Amazon SES may make sense for you. I work for JangoSMTP and we get a lot of clients coming to us from other transactional email providers because they need more. Deliverability is a major issue that comes up. You may be able to send out mass quantites of email, but without an experienced email marketing provider you may struggle to reach people’s inboxes. Delivery is as much an art as it is a science, and it takes constant focus to stay on top. Also, Amazon only offers an API. JangoSMTP gives you the option to send through an SMTP server as well as API. We also offer open and click tracking, as well as advanced reporting (Google Analytics, logging, etc.). If reporting is important to you, you will want to consider a service like JangoSMTP that is more advanced than Amazon SES. Aaron, can you provide some more details on SendGrid “crashing”? Deliverability is everything when you are sending mass emails. Because there’s too many spam emails in the world, each ISP has original email filters. In example, one ISP blocks all email when you send more than 100 emails per minute, and another ISP blocks when it reached 50 emails per minute. Most of these ISP filters are in blackbox, so the mass-emailing company like SendGrid probably has there own logic to avoid blocking against each ISP. So when you’re comparing mass-emailing services, key factors are their experience and knowledge for deliverability. If Amazon SES is using the same method of their e-commerce business, SES wins by knowledge and cost performance. But when SES is somewhat different from their original, SendGrid (or alternatives) is current choice. In addition to ISP filter, SPF and DKIM is just a basic. Some ISPs own more sophisticated filtering algorithm. I work at SendGrid and would love to learn more about (a) the nature of your email sends (eg, transactional or bulk? ), (b) the exact problem you experienced (ie, what do you mean by “crashing”), and (c) how did our support team perform when contacted to address the issue? Other than that, I’d like to thank Will for all of his work to create this comparison. I think that the post itself and the comments above are very valid and extremely useful for all. I’ve used SendGrid and never had it “crash” but have had problems with delays in sending mail. After investing some cash in getting my own mailing script modified to improve speed, send speed began to bottleneck at SendGrid. Also I’ve set up an SES account and started to ramp up with it and noticed right off the bat that emails sent to a business Gmail account are reaching the inbox! With SendGrid they *always* got quarantined no matter what. For instance if I send 25 million emails , 1 MB, each, I’m on the 3rd price segment (40TB) and at $0,09 the GB times 24.414 I should pay $2.197 on data transfer plus $2.500 on the communication. Is someone using it already who can validate that both costs add up? They provide promotional emailing for $0.10 per 1000 emails. The advantage with them is that they provide with a WebApp using which you can send and track your campaigns.